Home > News > Congratulations Kelly and Samantha on completing Rottnest Channel Swim! 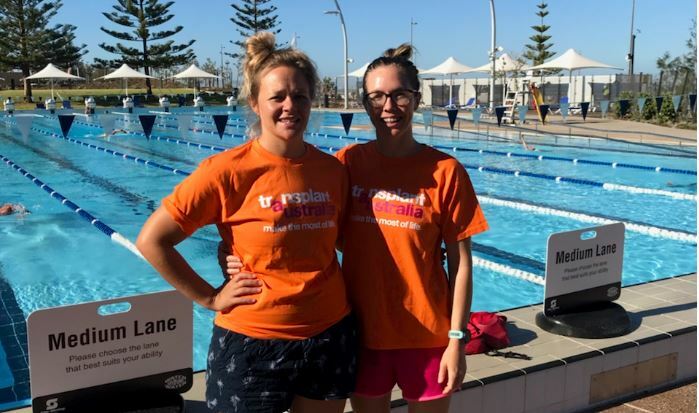 Transplant Australia is very grateful to these amazing women, Kelly and Samantha, who raised money for Transplant Australia by completing the Rottnest Channel Swim, a 19.7km swim from Cottesloe Beach to Rottnest Island in WA. This event is one of the largest open-water swimming events in the world, with over 2000 people taking part. Kelly and Samantha, who travelled from NSW to take part in the event, completed the mammoth swim in 5 hours and 54 minutes. Kelly is a Sydney-sider and Sam, a teacher, is from Forster. The friends grew up in Tamworth where they used to compete against each other in swimming and water polo. Now, the generous, water-loving duo have completed an enormous physical challenge for a life-saving cause. Transplant Australia CEO Chris Thomas said, “On behalf of Transplant Australia, I’d like to congratulate Kelly and Samantha on finishing the race, and thank them for supporting us. Samantha swam in tribute to her brother, who was an organ donor and saved multiple lives. If you’re reading this, we encourage all Australians to #MakeItCount and add their name to the Australian Organ Donor Register at donatelife.gov.au. It takes less than two minutes, and could one day save so many. To make last minute contributions to Kelly and Samantha’s campaign, please visit their fundraising page to support their journey.